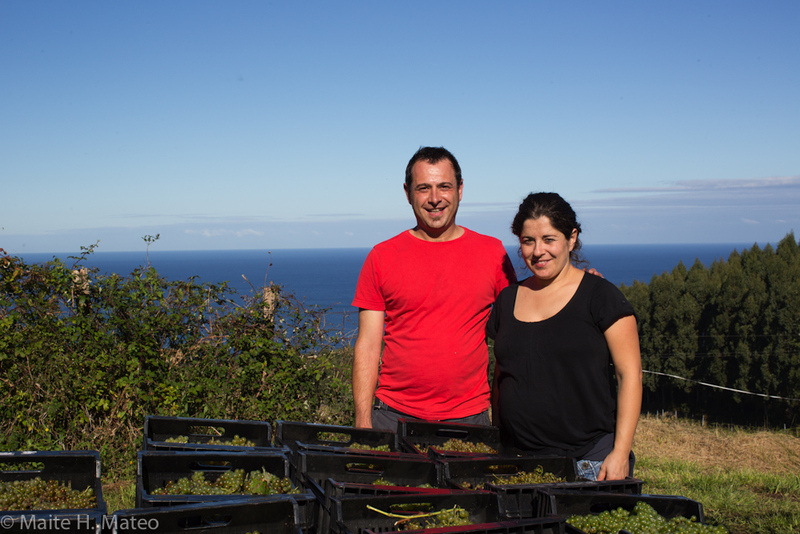 Adur owners Héctor Gómez and Maitena Barrero on a rare and perfectly beautiful, sunny harvest day. 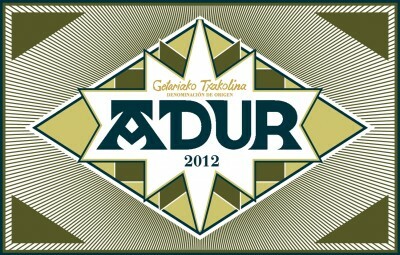 Adur is a very small, vineyard-driven winery comprised of small plots set in the hills overlooking the seaside Basque town of Getaria in the north of Spain. It is a personal project, founded in 2010, by the husband and wife team of Maitena Barrero and Héctor Gómez, both accomplished winemakers and agronomists. Their dedication and love of their vineyards combined with their non-interventionist skills in the vineyard and winery result in brilliant Txakoli wines. The real secret of Adur’s quality—something akin to a single vineyard Sancerre—is their work in the vineyards. Harvesting ripe, healthy grapes is the primary challenge of the region, due to all the rain and lack of sun. Their overall philosophy is non-interventionist, adopting their own techniques in canopy management and other methods in conjunction with the traditional high trellises of the area to better avoid the threat of mold and mildew. And this is the hard work that makes Adur such a pleasure to drink. The dream of Adur began when Maitena and Héctor were establishing their winemaking careers for much larger concerns, with experience in Rioja, Navarra, Ribera del Duero, Toro and the south of France. As their abilities and command of the winemaking process grew, they began to think of a winery of their own. The pull of Maitena’s family roots led them back to the Basque country, in the tiny Txakolina Getariako DO. The cool, rainy climate of the Basque coast does not make for an easy place to grow grapes, or acquire quality vineyards as there is little suitable acreage. But their passion and desire has made the winery a reality, with the help of family during harvest and lots of travel time back and forth to their primary winemaking jobs. We witnessed the challenges of viticulture there ourselves while visiting, when a wizened neighbor vigneron stopped by. He was puzzled how it was that Maitena and Héctor’s vines were in relatively good shape, while there was some mildew going around in the area. They had no one answer, besides working the vines. It was rather a combination of small things that enable them to eek out a deeper intensity, body and minerality than is typical of the traditionally spritzy Txakoli of the area. And this is how they have created their own distinctive, expressive Txakoli that shows what Hondarribi Zuri can be when treated as a serious grape.